June is no longer the most sought after month to get married. In this day and age, any month is fair game for elaborate weddings, receptions, and just married goodbyes. Tradition is always at the forefront in one way or another. 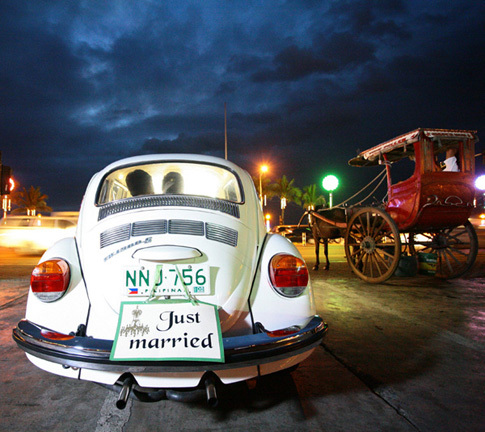 I believe that even beyond the sanctified first kiss which proclaims ones marriage to another, the “getaway car” is perhaps one of the strongest symbols of moving into marriage and starting a family, that there is. 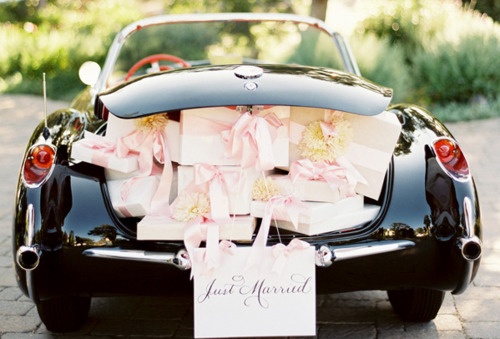 The car is often rented and vintage in style whenever possible. Vintage has always been akin to tradition. However, even if a vintage model of automobile cannot be obtained, at the very least one’s just married vehicle is sure to be adorned in ceremonial splendor of strings and ribbons, boots or cans, a soaped “just married” back window, or a sign that remarks the festive occasion. And now delicate and stylish just married decals can be bought. Photos, of course are always a must. Here are some of my favourites and most popular with a click through to the source if one is available. Got any Just Married stories you’d like to share? E-mail us and your story could be featured on The Pretty Life.